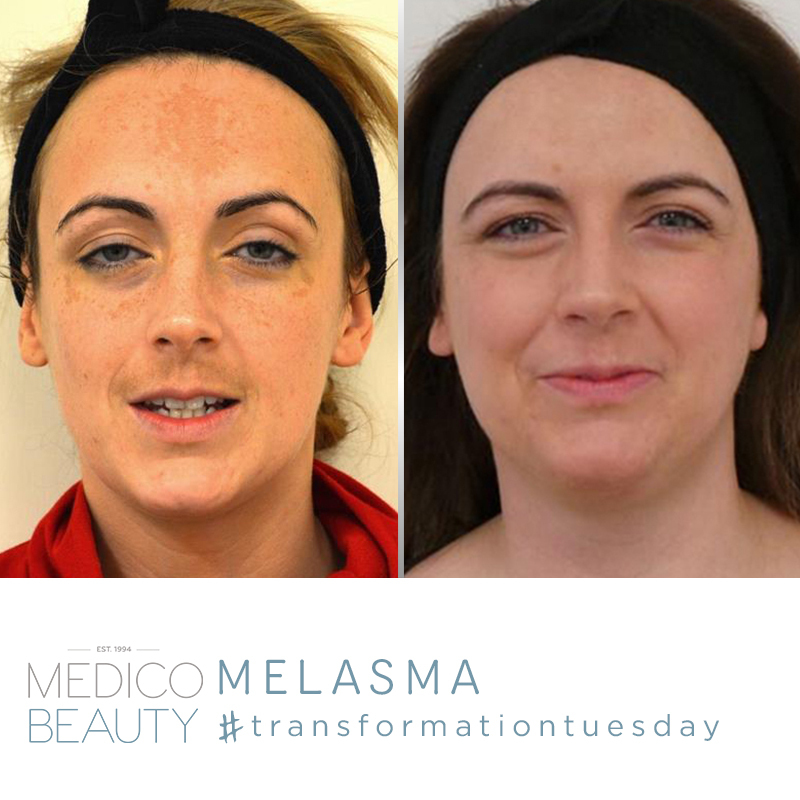 Claire had been suffering from Melasma for several years and like many woman she wanted to have the courage to be able to go makeup free, but her confidence was low. Melasma is a common skin condition in which light to dark brown patches of pigmentation occur. Although melasma does not cause any itchiness or pain many women find these dark patches embarrassing and difficult to cover with makeup. Claire’s main areas of concern were mainly her forehead, upper lip and eye area which are fairly common facial areas affected by Melasma. Claire turned to CosMedix after trying several high street products to no avail. After much research she found CosMedix products which have a great reputation for ingredient quality and effectiveness. There are essentially three different types of Pigmentation issues that can arise in the skin. Hyper Pigmentation is found in the skins outer most layers called the, “Epidermis.” This can arise following sun exposure where the skin has tanned but doesn’t do so evenly. Often older people develop Hyper Pigmentation because the skin cells found in the deeper layer (Stratum Basal) called Melanosomes, are responsible for making pigment granules called Melanin. Melanosomes become damaged by UV radiation and other environmental factors that result in DNA damage. This is the software that controls how the cell behaves and when there is a mutation the cell no longer functions normally, often over producing melanin granules. We like to describe this breakdown, as being just like when a fireman hoses down a burning house but unfortunately, floods the soil around him as the hose doesn’t get switched off! Combined with a decrease in skin cell renewal rate, it is no surprise that patches of brown spots appear on the skin’s surface. Having determined when skin damage first sets in we know it is often before the age of twenty-four. This is important to register because even if sun exposure has been limited or stopped later in the life, the healthy processes that helps the skin to repair following exposure to UV radiation and remain even in colour have already started to decline many years beforehand. The rot has effectively already set in! All skin types are prone to developing Hyper Pigmentation but the large, brown patches are found in darker skins because by design they are more likely to product browner pigment. Fairer skin types are programmed to produce more red that is why when exposed to sunlight their skin burns. Interestingly what have lead to an increase in seeing issues with pigmentation aren’t sun exposure but the different skin types that have emerged due to inheriting a combination of genetic heritage. If one parent is fairer skinned than the other. Having a combination of different skin types, even when a person appears fair skin in the winter months, if they tan when exposure to sunlight (rather than burn) their skin behaves in a similar fashion to a dark skin. This “deviated” skin type is far more likely to see issues with Hyper Pigmentation and must be particularly vigilant of how they long they exposure their skin to sun and take other measures to protect the skin including wearing a hat when in direct sunlight. In addition a number of women are unaware that taking the contraceptive pill can increase the likelihood of developing Hyper Pigmentation because the effect of the medication increases photosensitivity (which is the likelihood of burning). The risk of Post Inflammatory Hyperpigmentation (PIH) is also greater in darker skin types that are burnt or irritated by contact with a product that is made with irritants such as perfumes. In all cases of Hyper Pigmentation where the damage lies isn’t as “deep” in the skin as Melasma. The skin darkens more than the surrounding skin with exposure to sunlight. For this reason it’s much more challenging to treat and requires a blend of many different active ingredients to tackle the root causes that do include sun but the over production of pigmentation is related to hormonal shifts that happen in pregnancy or other auto immune conditions such as Hyperthyroid. The effect of medications including Statins taken to reduce Cholesterol also raise the skin’s photosensitive. In many cases it’s normal to see a mixture of two different types of pigmentation Hyper Pigmentation and Melasma. 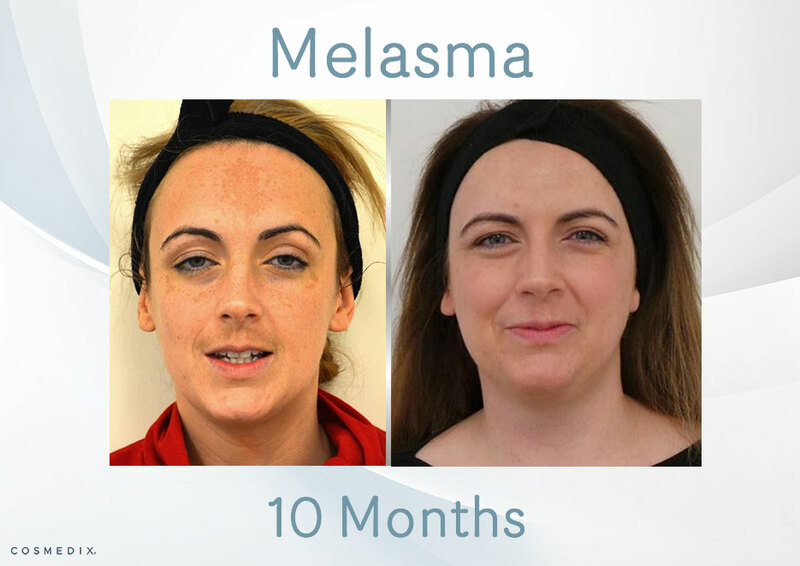 The Melasma looks like a patch, around the face and often looks like a mask. Causing dark patches to appear above the lip, forehead on the cheeks and under the eyes. The condition has been found to run in a family that also suggests it could be hereditary. It is highly unusual to see Melasma in men and more likely to be related to an underlying health problem in a person that is darker skin such as Asian Indian. There are several factors which have been found to contribute to Melasma but each person is an individual and requires proper extensive consultation to help determine what could be causing excessive stress to the skin and damage to healthy digestion. Hormone treatments – oral contraceptive pills that contain oestrogen and/or progesterone, hormone replacement and intrauterine devices are causing factors in about a quarter of affected women. Pregnancy – however, the pigmentation usually fades a few months after the birth. Sun Damage – the most common cause and the fortunately the most avoidable. Other medications – some therapies for cancer and even general toiletry products can lead to the onset of Melasma. Skin affected by Melasma darkens more than the surrounding skin with exposure to sunlight, so sun-avoidance and sun protection are key to helping Claire’s skin. Year round sun protection is important even in the winter months. Claire visited her local Cosmedix Skin Expert at La Belle Forme in December and went through an initial consultation and seven point skin analysis. During the consultation her skin therapist put together a skincare plan of CosMedix products and treatments which Claire was eager to get started. First up was CosMedix Pomegranate peel which is suitable for every skin type including sensitive and dry skin. This peel is a great skin renewing treatment ideal for melasma as the Lactic acid provides gentle resurfacing and leaves skin immediately smoother, radiant and glowing. Claire found there to be no discomfort with the application and only experienced the usual mild tingling sensation for the first few minutes after application. Another benefit of the Pomegranate peel is there is no downtime – meaning Claire could wear make-up the very next day. Claire’s skin therapist also decided to use a series of five Cosmedix Benefit Peels. This peel is the perfect treatment series is perfect for Claire’s Melasma and works well with fine lines and wrinkles. CosMedix Benefit Peel id packed with Vitamin C and Encapsulated Retinol leaving skin brighter, smoother and more evenly toned. Next up a CosMedix Timeless Peel which really is the gold standard in anti aging peels. Timeless is designed to stimulate collagen and elastin production as well as cellular turnover which is perfect for Claire’s Melasma. This highly concentrated peel is formulated with L-Retinol AGP and L-Lactic Acid which helps exfoliate and resurface the skin without causing irritation. Nearer the end of her treatment Claire’s skin therapist also thought she would benefit from a CosMedix Deep Sea Peel. This peel is a micro-fine exfoliating treatment with marine-derived extracts ideal for stubborn Melasma and leaves skin dramatically smoother, firmer and evenly tones. After the initial consultation with Claire her skin expert felt she would also benefit from a series of LED Green Light Sessions. Light Emitting Diode (LED) Technology uses wavelengths of light to stimulate cells and promote collagen growth. It is 100% safe and has quickly become of of the most effective non invasive ways to promote skin rejuvenation and repair. Perfect for Claire’s skin the LED’s penetrate deep into the dermis layer of the skin to stimulate the collagen and elastin. Sun protection is key to helping Claire’s skin remain free from pigmentation all year round even in the winter months. The best effect comes from a combination of sunscreens including mineral makeup and Hydrate+ SPF 17. It is more effective to apply more rather than less sunscreen and on a frequent basis (every two hours), rather than a very high factor of SPF 50 once a day. If not enough sunscreen is applied the level of protection usually equivalent to far less than SPF 50 usually around SPF15. As most people don’t apply two tablespoons of the product, we know using mineral makeup in combination with a mineral sunscreen offers long staying protection that is sweat proof. The best advice to follow when in direct sunlight is.”If you can’t grow a beard, wear a hat! Advanced “corrective ingredients” help to repair abnormal skin function including damage to melanosomes that are the pigment production cells. Claire increased the strength of ingredient in her routine and eventually graduated to using the highest level of Vitamin A derivative from CosMedix called LG Retinex. This is available in Serum 16 and CosMedix Elite Serum 24. If starting out Define offers a combination of both Vitamin A derivative, L-Retinol AGP Complex 2% and a complex of AHA’s. The most important step in conditioning the skin to using active ingredients is using a cleanser that has a proper pH, is made with L-lactic Acid (from yoghurt) a naturally derived exfoliating active that is gentle for all skin types. Claire used Purity Clean, 5% L-lactic Acid on a daily basis and also added a homecare treatment mask called Pure Enzymes which is made with L-lactic and enzymes. This active ingredients work in combination with Vitamin A derivatives (LG Retinex or L-Retinol AGP Complex) to cause for the conversion of it in the skin into stimulating all Trans Retinoic Acid. This is the portion of Vitamin A that interacts on a cellular level to increase the skin’s rate of renewal and repair on a deeper level far beneath the skin’s surface. Helping to successfully tackle damaged tissue so that the skin’s appearance on the outside is restored back to health. Antioxidants play a big role in helping damaged skin to recover as these actives help with the skin’s own immunity which is present to protect against the damaging effects of environmental exposure and UV Radiation. A highly potent cocktail of antioxidants will increase the natural defense mechanism that stops UV radiation from activating the second level of defense that is pigment production. When in balance the skin’s own production of antioxidants that happens within the cells can be activated indirectly using Vitamin C. This is found in Pure C which is a powder from of 100% L-Ascorbic Acid, a “clean,” easy to use blend that is mixed with any serum or cream. Claire loved all the CosMedix products but in particular her favourite peel was ‘Timeless’. She was absolutely delighted with the results and feels much more confident within herself. The effect on her skin is obviously visible and she would recommend CosMedix treatments to everyone. Claire advised to ensure you go to someone you can trust. As well as the changes in her skin care routines Claire has also made some lifestyle changes. She applies sunscreen daily and takes Vitamin D and Omega 3 supplements. Claire has also started using hemp oil that provides great protection for her skin whilst increasing its elasticity. Claire’s skin expert, Caroline received expert training in advanced CosMedix treatments with the Medico Institute and has worked with CosMedix products for 5 years, she also specialises in various laser treatments, as well as colonics. Caroline absolutely loves CosMedix treatments and products and always has confidence in the results. She strongly believes that active ingredients are the only things that make a difference. Other great advice she offers includes getting some good sleep, drink lots of water, focus on nutrition and take time out for yourself to help deal with stress. La Belle Forme is an award winning cosmetic medicine and surgery clinic, with consultations available in Glasgow, Aberdeen and London. The clinic is at the heart of pioneering aesthetic procedures, offering a wide range of surgical and non-surgical treatment options to their clients. Their committed approach to client safety and welfare at all times is what sets them apart in their field. La Belle Forme was founded by award winning Consultant Plastic Surgeon , Mr. Taimur Shoaib, who was named ‘Best Cosmetic Surgeon 2015’ in the coveted Medical Cosmetic Awards. La Belle Forme has been a valued Cosmedix Pro Partner for over 5 years. To find out more about La Belle Forme and their treatment options visit their website here.